You asked for it; Sing Core and Lowe’s gives you what you’re looking for. Super thin. As thin as 1.5 inch vs. average SIP panels are 6 inches thick. Easy to build. One piece construction which includes outside skin, interior skin and insulation. Structure wall vs. regular 2 x 4 stick built or SIP structure which adds many layers of excess material to build the wall, floor, and roof. 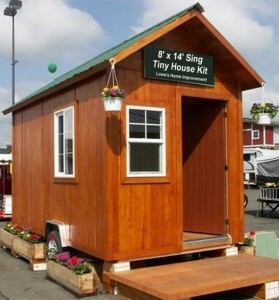 Sing Tiny House Panels are far superior than any other building material while being Eco-friendly. Sing Tiny House Panels are also used for high quality storage units (no mildew), wood sheds, living spaces, guest houses, ticket booths, pump houses, studios, disaster relief structures, utility sheds, playhouses, espresso stands and any other small building needs. They travel safely, construct quickly, and look beautiful. They weigh less than a third as much as an equivalent slab of sheet rock, so you can easily and safely construct your home in a few hours. Our prefabricated panels include insulation, framing and interior and exterior siding. Our thin sandwich panel walls give you more space inside your home. Includes 2″ Sing Sandwich panels (R18) for the walls and ceiling and 3″ Sing Sandwich (R22) for the floors only, for the avid do-it-yourselfer. Includes easy-to-connect 2″ Sing Panels (R18) for the walls and ceiling and 3″ Sing Panels (R22) for the floors with pre-installed windows and door.